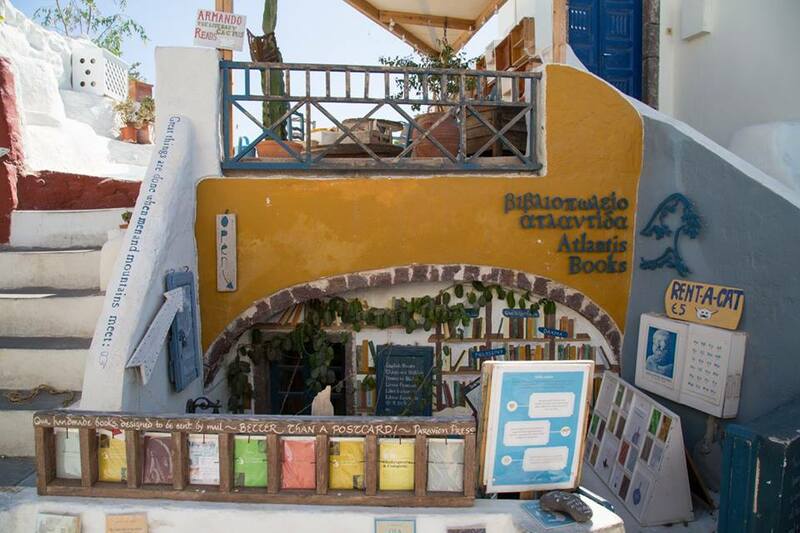 There’s a small cave of an independent bookshop in the most unlikely of places: on a Greek island, inside the basement of one of Santorini’s whitewashed houses in the small village of Oia. You may have heard of it. 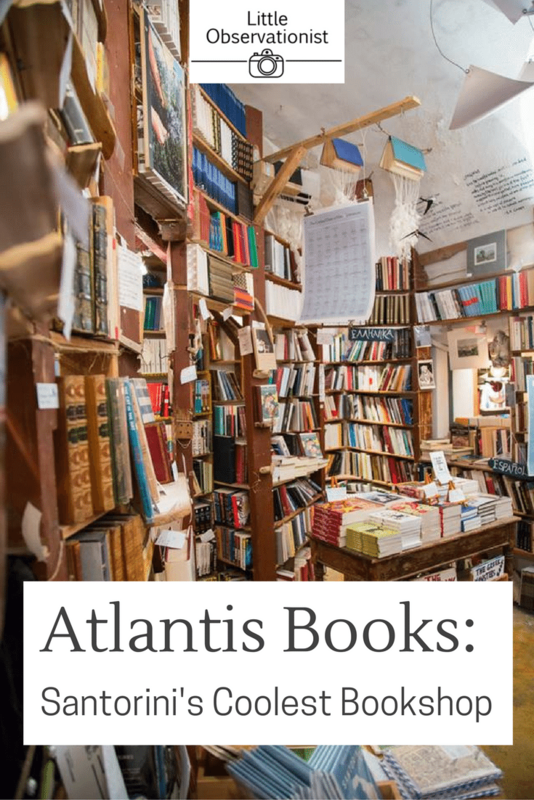 It’s called Atlantis and it’s been featured in media outlets across the globe: The New York Times, Vanity Fair, The Huffington Post, The Guardian. 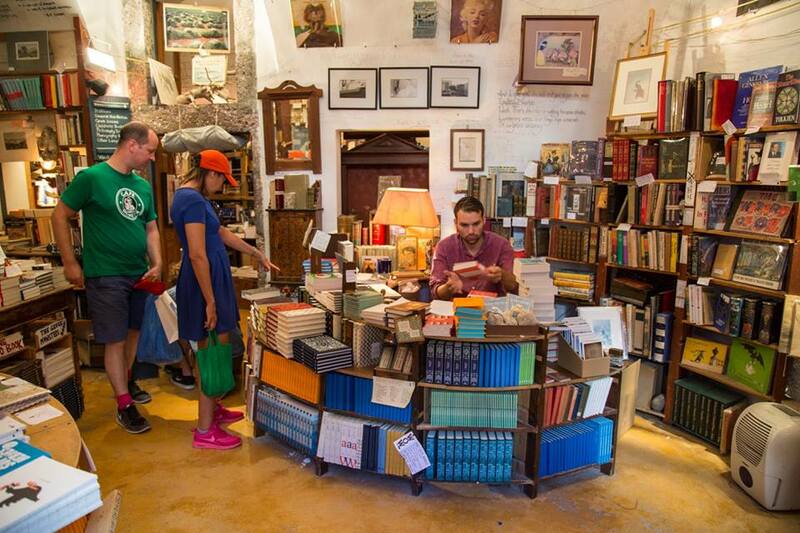 Fascinated by the stories and intrigued by its inclusion on lists of the coolest/best/most interesting/most beautiful bookshops in the world and in National Geographic‘s book Destinations of a Lifetime, we visited this little gem on our recent trip. 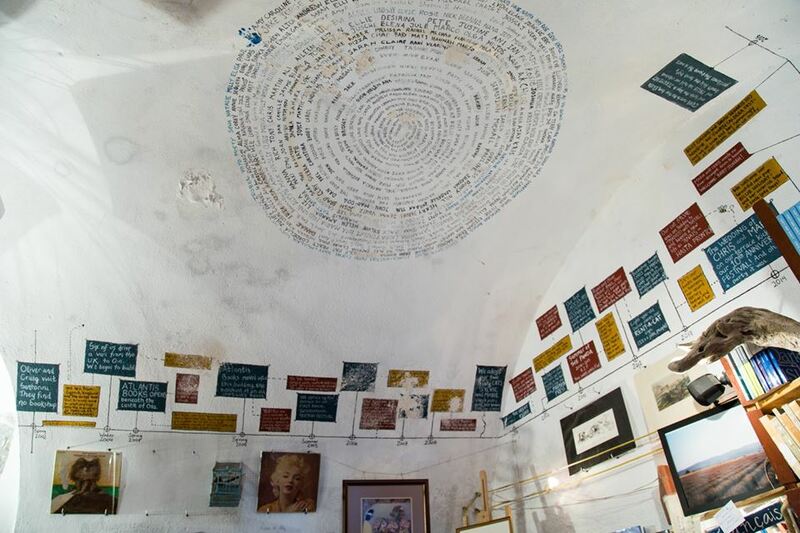 It’s a colourful place full of treasures where poetry is written on the walls and spiralled across the ceiling, where books in many languages are lined up next to one another. 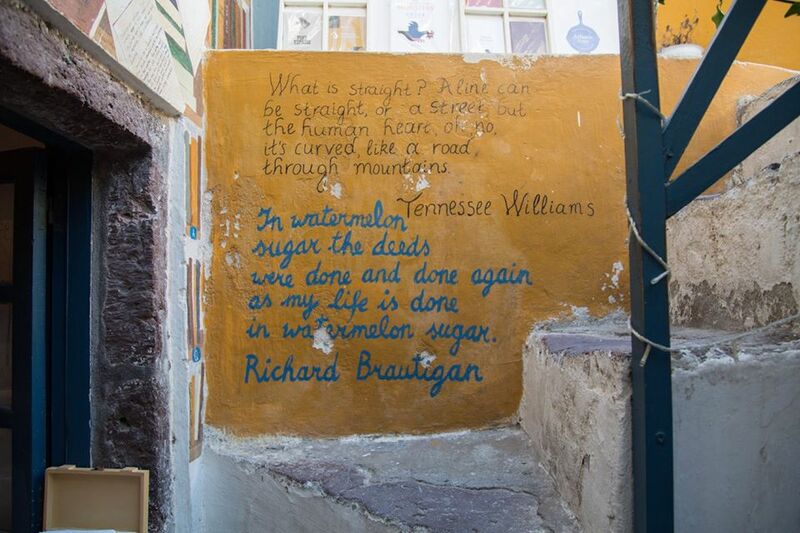 There’s fiction, non-fiction, philosophy and travelogues. 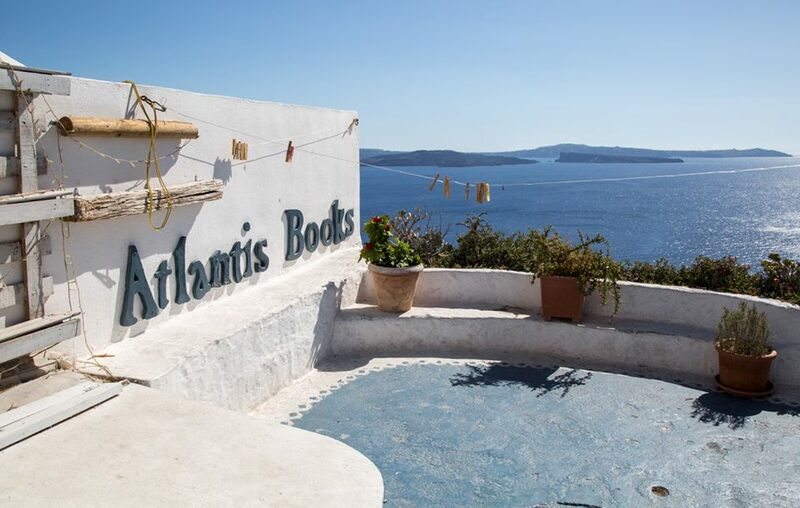 There are readings in the shop and bonfires on the terrace, which overlooks the famous Caldera sunsets and the jewel-blue Mediterranean Sea. The story of its beginning is one of dreams: friends traveling, a drunken business idea that actually came to life, long nights of dancing among the bookshelves with friends, debating the most beautiful covers, playing the cello among the spines and sleeping in the shop to afford the rent. 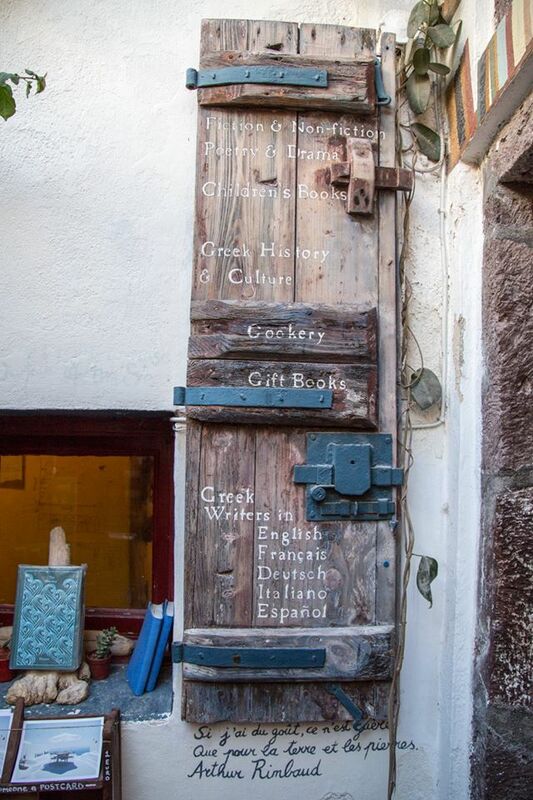 A bit of an expanded version, though there is more to it that you can read if you click any of the links above: Americans Craig Walzer and Oliver Wise arrived in Santorini by chance in 2002, ran out of books to read and, knowing there was no local bookshop, over wine, decided to open their own. They went to Athens to sort out the paperwork and returned in 2003 with some friends and a van full of books that they drove across the continent from Cambridge, England. While they didn’t have much of a plan, locals encouraged their vision. They adopted a cat and dog, rented a building, built shelves, put an old fisherman’s boat on the terrace and invited their friends along. Popularity grew and their dream slowly became a glorious reality. 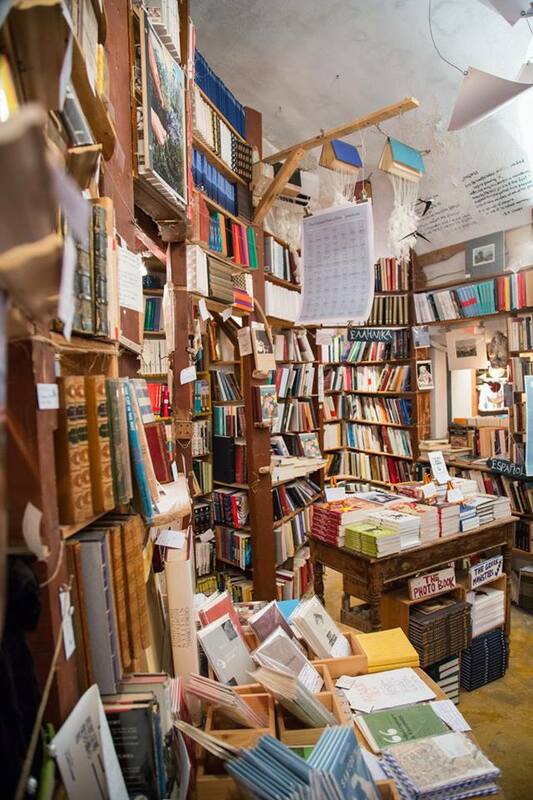 A friend and journalist from Paris included the shop on a list of favourite bookshops he compiled for the Guardian and other international media outlets jumped on the bandwagon to include it on their own. It grew from there. Visit now and you’ll find a friendly group of international staff running the shop each summer along with Craig Walzer who is the only one of the original founders still there. He recently presented at TEDxAthens if you’re interested in listening. 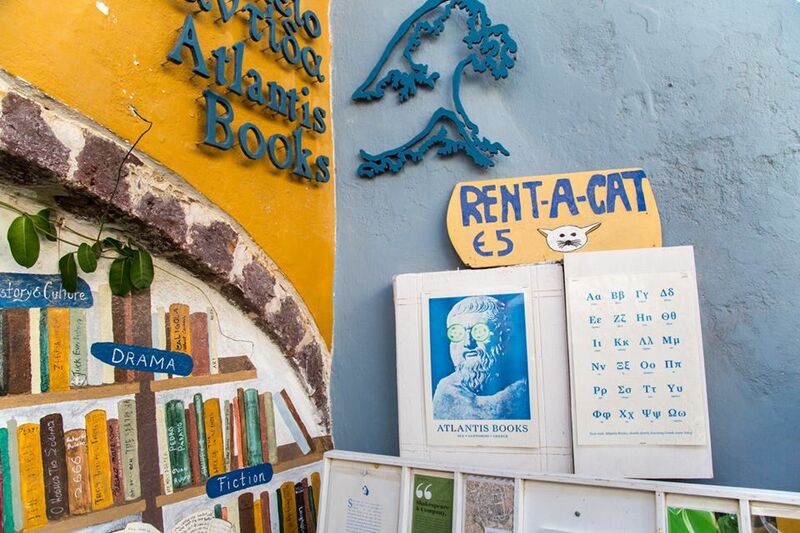 Bookshops are a struggle to maintain anywhere these days, but Oia is a village that relies heavily on tourism and most of it simply closes in the off-season, from the end of October to April. 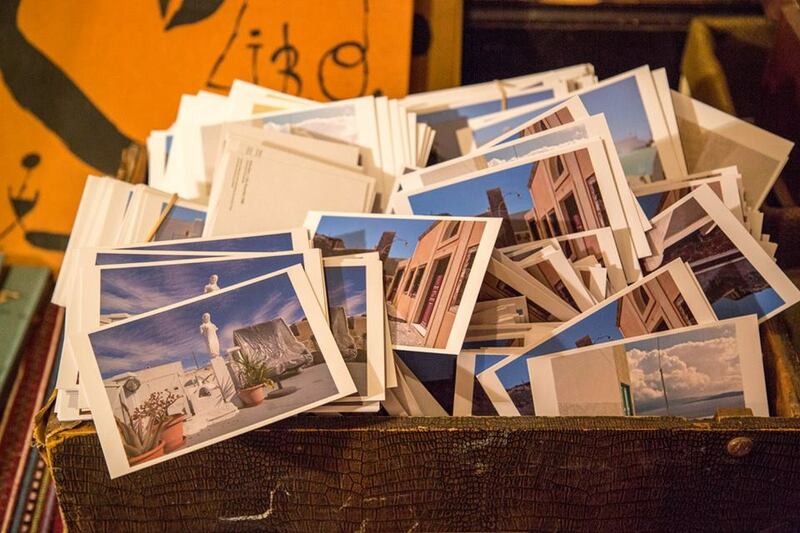 To keep the creative venture alive, they print their own books in the back of the shop, keep stocking more beautiful and rarer books, host bookbinding classes and film screenings and have even started the Caldera Festival. If you ever find yourself with an opportunity, this passion-fuelled little shop full of personality and character is well worth a trip. For more photos and stories from beautiful Santorini, see my previous posts: Oia 1, Oia 2 & Fira!